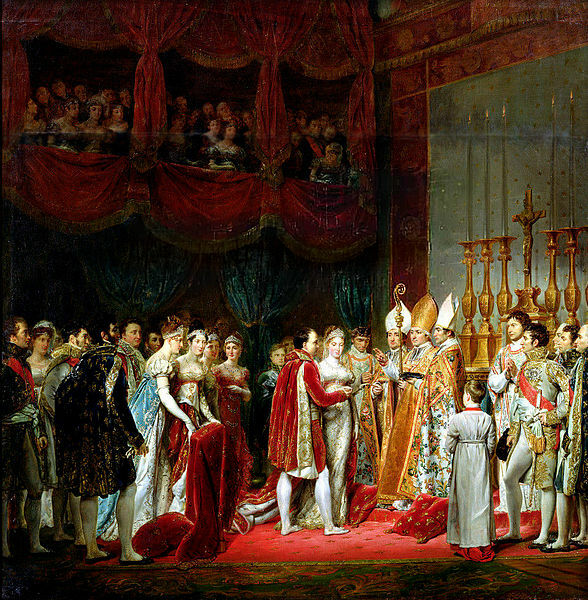 Marriage of Napoleon and Marie-Louise (1811) by Georges Rouget. Napoleon Bonaparte fell head over heels to the Austrian Archduchess Marie Louise the moment he laid his eyes upon her. Her beauty was such that the great emperor remarked: "You are much better-looking than your portrait." 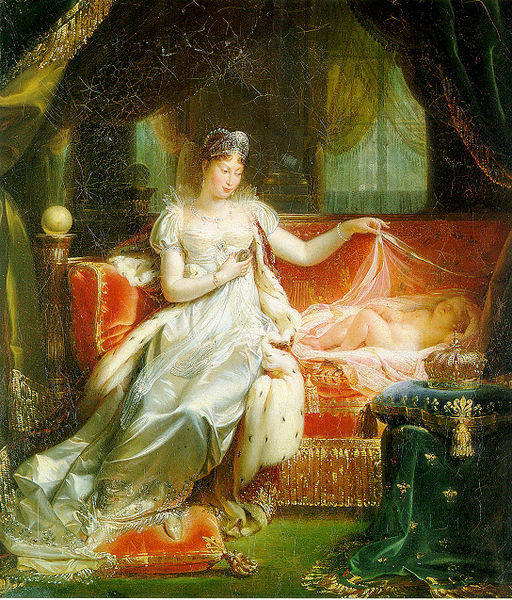 Napoleon initially thought he married a womb in Marie Louise (his first wife, Josephine, failed to bear him an heir). Eventually, their relationship turned out for the better until it cooled down after Napoleon’s fall. Maria Ludovica Leopoldina Franziska Therese Josepha Lucia was born on December 12, 1791. Her father was then-Archduke Franz of Austria, while her mother was Maria Theresa of Naples and Sicily, Franz’s second wife. A year after her birth, Franz succeeded as Holy Roman Emperor and ruler of the vast Habsburg dominion, after the death of his brother, Emperor Leopold II. Franz would be the last of the long line of Holy Roman Emperors. Marie Louise was raised to detest France and everything it stood for. However, after Austria’s disastrous defeat by France in 1808, peace had to come to the land. Napoleon long wanted to legitimize his family’s position as among Europe’s noblest. What better way to do so than marry a European princess? He started the divorce proceedings with Josephine while searching for a suitable bride from one of Europe’s royal families. He initially thought of Grand Duchess Anna Pavlovna of Russia, but he later balked after delayed negotiations with the Russian officials. It is probable, though not quite certain, that the first suggestions of a marriage between Napoleon and Marie Louise emanated secretly from the Austrian chancellor, Metternich. The prince de Ligne claimed to have been instrumental in arranging it. In any case the proposal was well received at Paris both by Napoleon and by his ministers; and the difficulties respecting the divorce of Josephine, were surmounted. Throughout the negotiation, Marie Louise had no idea of her marital prospects. She was only informed later by Metternich after Prince Schwarzenberg signed the marriage contract. Upon hearing her fate, Marie Louise replied: "I wish only what my duty commands me to wish." The marriage took place by proxy in the church of St. Augustine, Vienna, on March 11, 1810. The bride’s uncle, Archduke Charles, represented the groom. The ceremony was hailed for its opulence and the Frrench ambassador said that the wedding "was celebrated with a magnificence that it would be hard to surpass, by the side of which even the brilliant festivities that have preceded it are not to be mentioned." The new empress was joined on her trip to France by Napoleon’s sister, Queen Caroline Murat, who had her go through a French wedding tradition: the bride was asked to be stripped naked, take a bath and wear on French clothes—a sign that she had to keep nothing of her homeland for she was now Empress of the French. She fianlly met Napoleon on March 27, in Compiegne. The civil and religious contracts took place at Paris early in April, and during the honeymoon spent at the Palace of Compiegne, the emperor showed the greatest regard for his wife. Marie Louise, meanwhile, wrote to her father the Emperor: "I assure you, dear papa, that people have done great injustice to the Emperor. The better one knows him, the better one appreciates and loves him." The marriage, however, was not without tension; Napoleon sometimes couldn’t help but compare Josephine and Marie Louise. While she thought of Josephine as outgoing and passionate, he criticized his new wife for being shy and timid. In fact, Napoleon and Josephine remained in close contact with each other, one thing that dearly caused Marie Louise to be upset. On March 20, 1811, Marie Louise gave birth to a son. They named him Napoléon François Joseph Charles Bonaparte and he took the courtesy title “king of Rome.” Napoleon had finally achieved his goals: he married into one of Europe’s greatest houses, he had a son and heir and he was the most powerful man in Europe. But his joys were not to last. In 1812, his disastrous invasion of Russia proved unsuccessful and it marked the beginning of his downfall. In January 1814 he appointed Marie Louise to act as regent of France (with Joseph Bonaparte as lieutenant-general) during his absence in the field. When it all seemed that Napoleon was on the verge of defeat, Marie Louise reluctantly left Paris. She at first did not want to evacuate, hoping her son would succeed Napoleon in the event of his abdication or deposition. Marie Louise also thought that leaving Paris would strengthen the claims of the Bourbons to the throne. Marie Louise was finally persuaded to leave by Henri Clarke upon orders from Napoleon, who remarked: "I would prefer to know that they [the Empress and the King of Rome] are both at the bottom of the Seine rather than in the hands of the foreigners." On March 29, Marie Louise and the court moved to Blois, only one day before the Allied forces captured Paris. Marie Louise was surprised to find out that her own father deprived her son of the crown of France. On April 3, Napoleon was deposed by the Senate; on April 11, 1814, he abdicated. 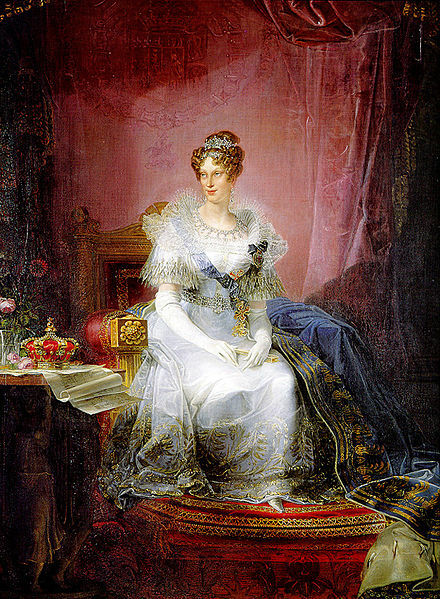 Instead of joining Napoleon in Elba, Marie Louise and her son proceeded to Vienna, escorted by Count von Neippeg; her alienation from him was sealed when he threatened to abduct her. But Marie Louise was neither a heartless wife nor an indifferent mother. She was miserable: “I am in a very unhappy and critical position; I must be very prudent in my conduct. There are moments when that thought so distracts me that I think that the best thing I could do would be to die," she wrote. During the Hundred Days, Marie Louise manifested no desire for the success either of France or Austria. She sent Napoleon a message through his private secretary, Claude François de Méneval, telling him: "I hope he will understand the misery of my position ... I shall never assent to a divorce, but I flatter myself that he will not oppose an amicable separation, and that he will not bear any ill feeling towards me ... This separation has become imperative; it will in no way affect the feelings of esteem and gratitude that I preserve." Napoleon met his final defeat in Waterloo and was banished to the small island of Saint Helena in the Atlantic. From then on until his death, Napoleon made no more attempt to contact her personally. 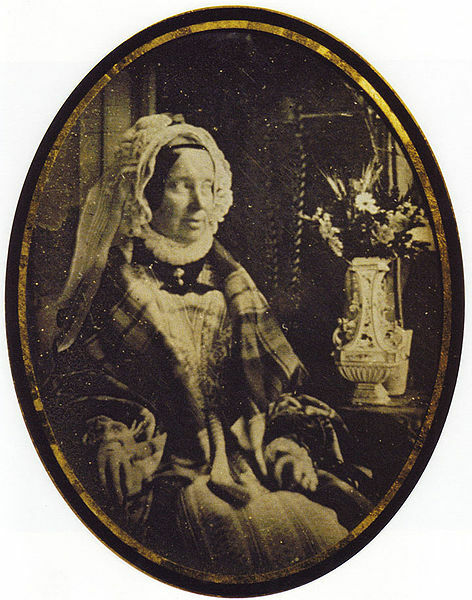 A Daguerreotype of Marie Louise taken in 1847, shortly before her death. The Congress of Vienna recognized Marie Louise as ruler of the duchies of Parma, Piacenza and Guastalia for life. The new Bourbon King of France, Louis XVIII strongly opposed to these concessions. Czar Alexander I of Russia, however, backed Marie Louise’ claims so the French King couldn’t do otherwise. Her son, however, was not allowed to join her in Parma and was barred from taking his inheritance. The Allied forces thought it was best not to give any of Napoleon’s heirs the chance to make hereditary claims. He was instead given the landless title of “duke of Reichstadt”. Long before the news of Napoleon’s death reached her she was living in intimate relations with Neipperg at Parma, and bore a son to him not long after that event. Napoleon on the other hand spoke of her in his will with marked tenderness, and both excused and forgave her infidelity. Neipperg became her morganatic husband; and they had other children. In 1823 she visited the Duke of Reichstadt in Vienna when he was dying. Her rule in Parma, conjointly with Neipperg, was characterized by a clemency and moderation which were lacking in the other Italian states in that time of reaction. She preserved some of the Napoleonic laws and institutions; in 1817 she established the equality of women in heritage, and ordered the compilation of civil code which was promulgated in January 1820. On the death of Neipperg in 1829 his place was taken by Baron Werlein, whose influence was hostile to popular liberty. In 1831 Marie Louis had to take refuge with the Austrian garrison at Piacenza; on the restoration of her rule by the Austrians its character deteriorated, Parma becoming an outwork of the Austrian empire. She died in Vienna on December 18, 1847.
de Saint-Amand, Imbert (2010). The Happy Days of the Empress Marie Louise. Miami: HardPress Publishing.